Our Milky Way galaxy is heavier, moving faster and therefore more likely to smack into its nearest neighbor than astronomers thought. Precision measurements of the Milky Way show that the galaxy is rotating about 100,000 miles per hour faster than previously understood, said Mark Reid of the Harvard-Smithsonian Center for Astrophysics—so here in our part of the galaxy, our little solar system is moving at about 600,000 miles per hour rather than the previously estimated 500,000 miles per hour. 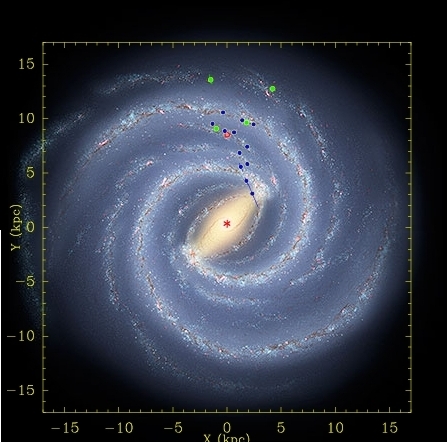 The additional rotational velocity implies that the Milky Way’s mass is half-again as great as what had been thought, making it just about as hefty as the Andromeda Galaxy. “No longer will we think of the Milky Way as the little sister of the Andromeda Galaxy in our Local Group family,” said Reid. That extra mass means the Milky Way exerts a greater gravitational pull, which in turn makes it more likely that we will collide with Andromeda or smaller galaxies. The scientists used the Very Long Baseline Array, a system of 10 radio telescopes stretching from Hawaii to New England to the Virgin Islands, to map the Milky Way in great detail—specifically, the distances to and motions of various regions of it. That brought another surprise: our galaxy probably has four, not two, spiral arms of gas and dust where stars are forming, as you can see in this cool artist’s rendition. A third discovery addresses the conundrum of how young stars manage to exist in the center of the Milky Way. Logically, they either formed there or fell there. Two problems: the black hole at the galactic center produces such strong gravitational tides that any nearby stellar maternity wards (molecular clouds) should be ripped apart, preventing stars from forming. Yet stars falling inward after forming elsewhere is a rare occurrence. Using the Very Large Array of 27 radio telescopes in New Mexico, astronomers led by Elizabeth Humphreys of the Harvard-Smithsonian Center for Astrophysics spied two protostars 7 and 10 light-years from the galactic center. That means stars can form there, despite the proximity of a black hole that gobbles everything it can reach. “We literally caught these stars in the act of forming,” said Humphreys. But how? The explanation is probably that molecular gas at the center of our galaxy is denser than astronomers thought. Greater density would give a molecular cloud greater gravity—enough, it seems, to overcome tides from the black hole and hold together sufficiently to form new stars. An artist’s image of what’s going on near the galactic center is here.